Do not Treat yourself to this book!! Treat is a charismatic essentially preaching a prosperity gospel. Which is interesting in view of the fact that one of Treat’s earlier books was titled Errors of the Prosperity Gospel. 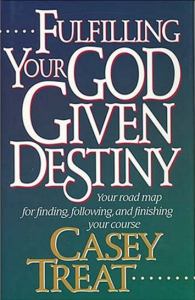 The writer’s treatise is that God has “planned your destiny and He will help you find it” which will in turn lead to “a life of significance and fulfillment.” Treat provides the formula in the book for finding your destiny. If you refuse to work out his formula in your life it is because you are: 1. Stupid, 2. Lazy, or 3. A Spiritual Dolt (words, mine – intonation, his). His “Destiny Key” is “When you believe you are who God says you are, you will be who God says you can be, you will have what God says you can have, and you will do what God says you can do. You will fulfill your destiny.” Of course, he uses lots of scripture to support his theses which are usually taken totally out of scriptural context in order to “support” a predetermined conclusion.